Sunday broke clear and cool, which helped a lot with my decision to get out of bed. Also, Mike was downstairs whipping up some croissants, so I had obligations. When I walked down to the kitchen (I had exclusive access, I’ll have you know…don’t expect the same treatment!) I was happy to see my Bianchi sitting pretty by the front door. And here’s some of the breakfast Mike had been slaving over for the previous 45 minutes or so, bless his heart. After a little logistics meeting we all agreed that, instead of doing a loop back to Pepieux today, I would get more bang for my Euro by doing a long meander to the south, then finally finishing back at Narbonne station, where Mike would graciously meet me with my backpack. So, I left Le Vieux Relais, hooked around the massive church next door, and found a nice little tailwind to take me south. 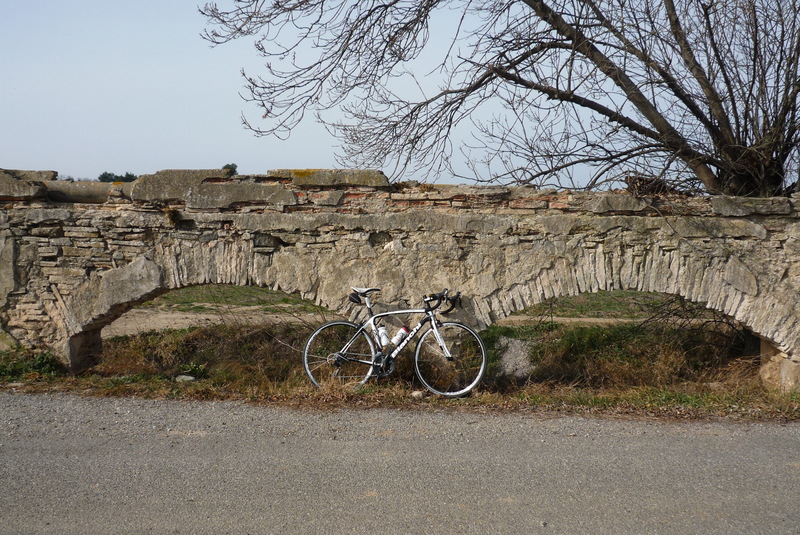 But not 5 km out of the village and I found myself needing a ‘nature stop’ (3 coffees can do that) – here, in fact – an aqueduct of indeterminate age. 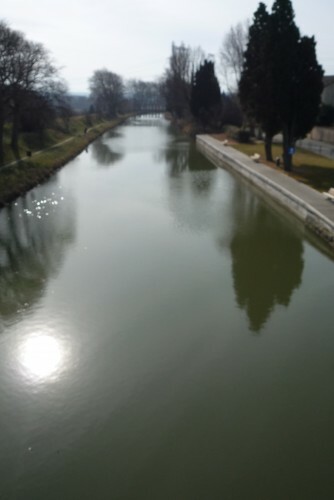 Le Vieux Relais is in a pretty good location, being close to 3 major cities down here (Béziers, Narbonne and Carcassonne) and it is also a stone’s throw from the Canal du Midi, a World Heritage Site and major tourist draw. Next time I go back I’ll take a spin along it (I have already, here, here, and here, if you’d like to see it), but I only had enough time to cross over it this weekend, I’m afraid. Travelling south meant away from the mountains, but not the climbs, I found out. It also brought me past the A61 autoroute that runs east-west along this part of Languedoc and, according to Val, is near an easy border marker (the D6113 just to the north) between the Minervois wine region of yesterday and the Corbières (get some if you see it…it’s awesome!) to the south. As I rode along I kept seeing a little mountain that looked to be in my way, and it was. 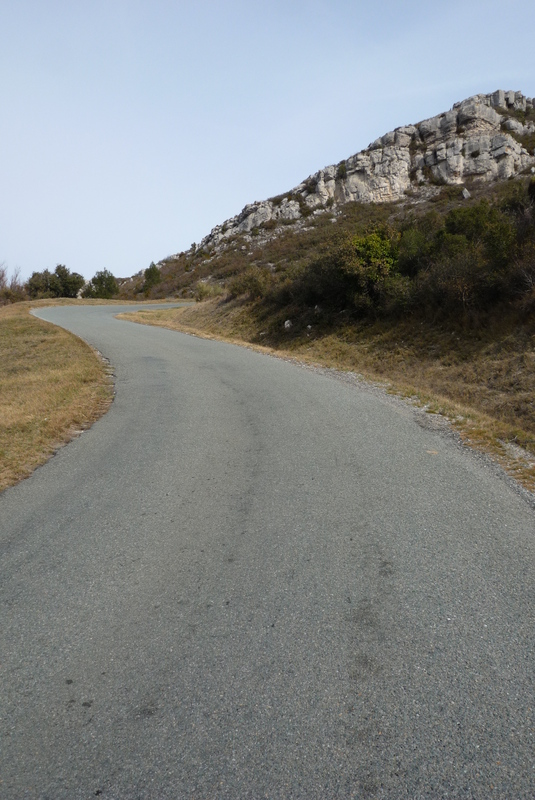 The climb up was really ideal, though, with a winding road and even grade of 6% to 8%. Oh, and not ONE car the whole way up. 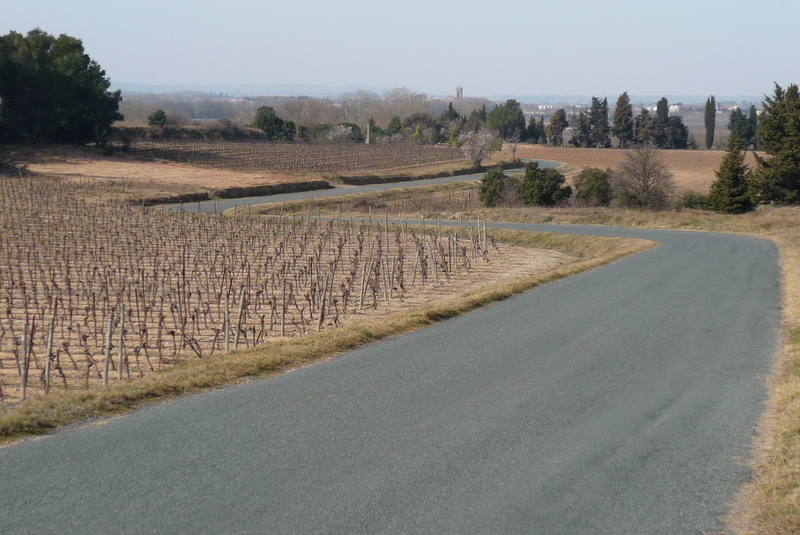 This climb was followed by a gentle descent into a wide, empty valley – well, empty except for vineyards. Soon enough I came across a sign that can either make you smile or bring on the dread. I was feeling good and the sun was shining, so I had a grin on. 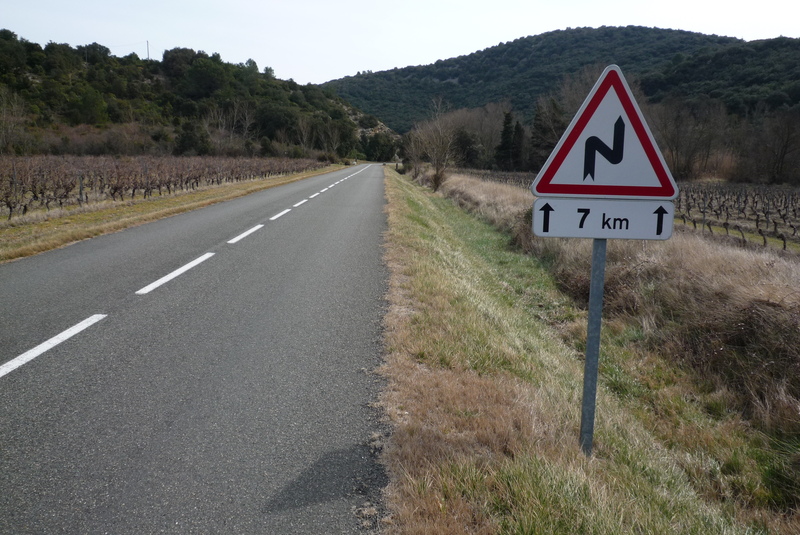 After a little saucisse frites in the center of Lagrasse, I was reloaded, but hoping for terrain that would aid in digestion, and luck was with me again because, although I did have a little climbing left to do, I also got another tailwind that carried me effortlessly the 40 km or so back to Narbonne. It all went off like clockwork, with Mike showing up well before my train was to leave and the train actually being nearly on time (the day before it was 25 minutes late…today, only 10 or 15). Aude always impresses me when I get down there – which is all too rarely – and there are really countless opportunities for guided rides. Now, we just need to convince somebody of this and we’ll be set! Many thanks for your kind hospitality, Val and Mike, and all the best in the coming season! 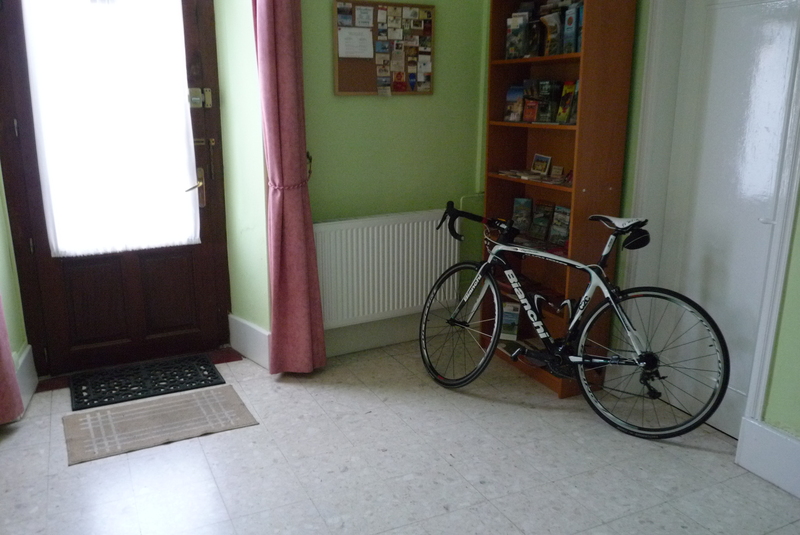 This entry was posted in Cycling and tagged le vieux relais. Bookmark the permalink. Sounds like Day 2 was a real treat compared to the cold weahter you experienced on Day 1. Thanks for sharing; this area looks like a beautiful area to ride through. Do you know if the Toue has ever passed through this part of France? Oh yeah, the Tour comes through there a lot. In fact, Stage 14 will come pretty close this year. And here’s Carolyn’s B&B, which is, conveniently, about a day’s ride from Val and Mikes! I can’t get over how different your scenery is from ours here in Creuse. 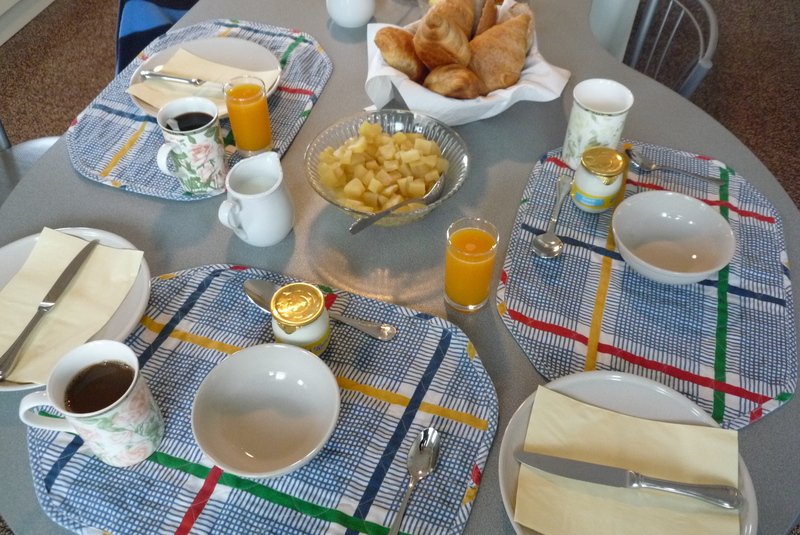 Lagrasse looks beautiful, but I think that photo of breakfast is the best one! I am a total croissant addict. BTW, had an interesting time at the Paris Nice today. Pics on my blog. I’m going over to your blog after this…looking forward to watching the stage on the trainer tomorrow. Can’t find a route map of the Croi Tour, so not idea. Are they running again this year? No, seriously. I want it. Please package up your life nice and neat (don’t forget insure it) and send to my local bike shop asap. Fizzhogg, I’m glad I held off on responding to your kind offer (where you live doesn’t look too bad either), but Steve has upped the anti. If you’d like to counter I’m willing to listen! Fabulous post and omg doesn’t it make me want to get back there. Read it thinking, geeze those roads look familiar, eat my heart out, when you mentioned Lagrasse. I loved my stop there, the food was great, the town fun, and the abbeys amazing. 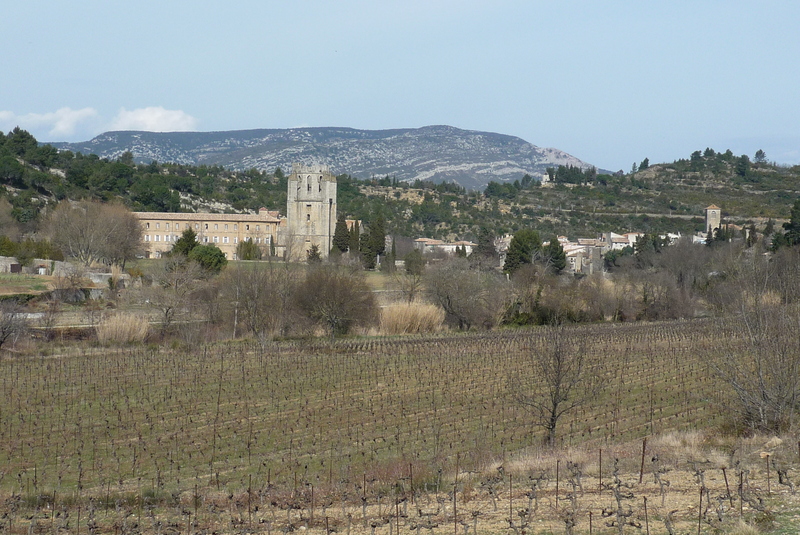 If your readers want more pictures, they could look at my description of Lagrasse and the ride into and away from it. The link is http://susancycling.blogspot.com/2011/09/lagrasse.html and the posts on either side of it. Everyone, every single person who wants to ride there should buy a ticket, hire you, and go. It is amazingly good riding. Not only did you not have bothersome traffic in early March, neither did I in September. I was thinking of you as I rode by Lagrasse, wondering if we’d taken the same roads to get there. 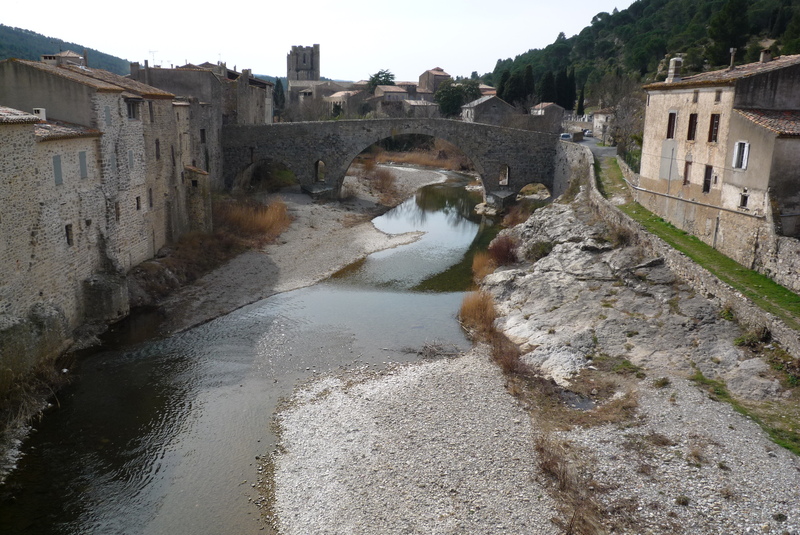 I’m going to save the ‘guts’ of Lagrasse for another time, so I can only comment on the outside for now, unfortunately. I think I’ll visit your blog to see what I missed! And you’re right, whether I’m hired or not, everyone needs to come here with their bikes (just not all at once, please). What a great ride! Unlike the demanding Fizzhogg, I will happily pay you for your life. Just give me a number and we can discuss. My one and only concern would be the issue of breakfast. As a fellow North American, you know exactly what I’m talking about. I’m curious to learn how you made the conversation without going mad. Fizzhogg is going to reconsider his original offer, so I won’t make any commitments, just yet, if you don’t mind. Good intel for the hungry cyclist, I think. I certainly didn’t mean to cast aspersions on your host, who laid before you an outstanding continental breakfast. It just brought to mind the basic difference in cuisine one would expect to find anywhere in France and how a person raised on Canadian Back Bacon may have learned to make adjustments! For one fully and complete, packaged life of Gerry, said Gerry will receive one slightly used, near-fine life of Fizz, which includes, but is not limited to: rubbing shoulders with second tier American television stars, a spatially furnished loft apartment in the heart of Cycling Mecca, and one William Shakespeare action figure – with removable quill and book! A Shakespeare action figure?! That’s WAY too steep for me. I’m out. Congratulations, Fizz, and well played. And I’m guessing you don’t even have kids, which would definitely downgrade my training quality. I’m not big on Shakespeare, but if you have a GI Joe with kung-fu grip, that could tip the deal over! Ah, I was reading my own thoughts into your words, Steve. Sorry about that! And my next trip I may carry a supply of my new favorite drug … to add to yogurt. Whey powder, always now associated with Coach Rob. Funny you should bring that combination up. I just had a delicious whey powder, yoghurt, berry, dried fruits post-ride salad! Just took another look at this, since I have a question, and didn’t see the answer. My question is: what did you do for a route into Narbonne? You know just what I think of the one I used, but it is unprintable. Also, I think you better keep a close watch on your life before one of your reader’s steals it! Suze, I’d like to tell you that I found a secret backdoor into Narbonne, but I think I took the same route as you, past Fontfroide Abbey then down that ugly National. The good news is that it was Sunday and traffic was really light. I went with the Shakespeare cuz, you know, doesn’t everyone in France write with a quill pen? I have 3 kids, I’ll throw them in, but you must promise to drive them to football (soccer) three times a week. You can have one of my G.I. Joe’s with Kung Fu grip – I’ll give you the red-headed dude. Hey, thanks for sharing! Exactly what I wanted to read. I’m doing research for a website about activities in the south of France and you’ve given me some really excellent reading on the Languedoc and cycling. I don’t know how people get so fit that they can cycle as far as you but bravo et bien fait as they say in France!